In the nineteenth century, the Simpson Desert was inhabited by 7 Aboriginal tribes, concentrated mainly around the watercourses on the desert boundaries. In good seasons, they moved into or through the desert itself, digging permanent wells along their route for survival. European settlement and a rapid expansion of pastoralism on the margins of the desert, from 1860 to 1900, resulted in the displacement of tribes, either by direct occupation of tribal lands or the attraction of tribe members to pastoral properties. The worst impact, however, was the Europeans' introduction of influenza which decimated the tribes and depopulated extensive areas of north and north-eastern South Australia, including the Simpson Desert, at about the time of the First World War. Finally a severe drought drove the last desert inhabitants away. Photo - Alfred Allen Simpson C.M.G., C.B.E., was the Chairman of Directors of A. Simpson & Son Ltd being a business that his father had started. The first European to see the grandeur of the Simpson Desert was the explorer Charles Sturt in 1845, but the desert was not fully recognised and named until the 1930s when another Australian explorer and geologist, Cecil Thomas Madigan, named it after Allen Simpson, the sponsor of his subsequent expedition. Notable among the early surveyors was Augustus Poeppel who located the junction of the borders of Northern Territory, Queensland and South Australia. The original peg marking Poeppel Corner, as it is still known, was removed to Adelaide for preservation in 1962 and replaced by a replica. Some of Poeppel's original mile posts and other historic markers can still be seen in the Park. 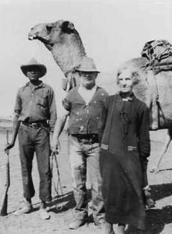 The first successful crossing of the desert is credited to E A Colson who, with an Aboriginal companion (P. Ains) and 5 camels, travelled from Mount Etingambra eastwards to Birdsville in 1936. The first motorised crossing, by geologist Reg Sprigg and his family, was completed in 1962. The Park's name was changed in 1972 to Simpson Desert Conservation Park, and the Simpson Desert Regional Reserve was established in 1988. Sturt – First attempt in a crossing was by Sturt during the years 1844 and 45. During Sturts expedition he named the Barrier Ranges (North of Broken Hill), Strzelecki, Coopers and Eyre Creek. Sturt travelled up along the Eyre Creek and turned back due to the poor conditions of men and horses. Leichhardt – German explorer, Ludwig Leichhardt attempted an East – West crossing and the party has never been found. Burke and Wills – The ill-managed and fatal expedition travelled up the eastern side of the desert. McKinlay – During 1861 & 1862, John McKinlay in the Alfred Howitt expedition found King alive and the remains of Burke, Wills and Grey. McKinlay investigated the Aboriginal story that Grey was killed by Burke with an axe. McKinlay can be considered as the person who opened up the Cooper and Diamantina country to pastoralists. Major Peter Warburton - lead an expedition around the top of Lake Eyre and came across a large Northern inlet. The inlet was mistaken as the Barcoo or Cooper Creek. Later named the Warburton. Lewis – John Lewis during 1874 & 75 mapped most of the Lake Eyre shores and the intersection of the Macumba River and Kallakoopah Creek. Lewis described the country as “Quite Worthless”. In 1872, Lewis accompanied Warburton along the Overland Telegraph Line to Oakover River in WA. Lewis also explored the areas along Goyders Lagoon and the Diamantina. During this trip, he named the Everard River and the Coongie Lakes. Hodgkinson – William Hodgkinson party founded by the Queensland Government explored the Western side of the Queensland state. He discovered and named the Mulligan River and Toko Ranges (Formerlly the Cairns Ranges). Mulligan was the person that started the Palmer Gold Rush in Queensland 1873. Henry Barclay under the direction of Surveyor General Goyder to explore the northern boundary of the Arunta (Simpson) Desert. On a second attempt after good rains discovered the Plenty River and the Marshall. Augustus Poeppel – Surveyed the intersection of Qld, SA and NT borders travelling from Haddon Corner. The survey was conducted due to Hodgkinson comment to the Qld government that if the land was to be used for pastoral tenure, then the boundary needs to be marked between SA and Qld. Winnecke - Charles Winnecke penetrated the Eastern side and much of the Hay River which he named after Adam Hay of Queensland Palparara Station. He also named the Field River after George Field of Queensland Sandringham Station. Lawrence Wells was instructed by the Surveyor-Generial Goyder to re-chain a section of the SA and Qld border from a location near Birdsville to Poeppel’s Corner. Wells party included Poeppel and Henry Cornish of the Survey Department, axeman Davies Hanson plus two Afghan Cameleers. In Jan 1884 the corner post had been relocated 315m east of it previous position. The expedition was difficult due to the season conditions, a lack of water and poor feed for the camels. Hanson became very ill and nearly died at the corner post. 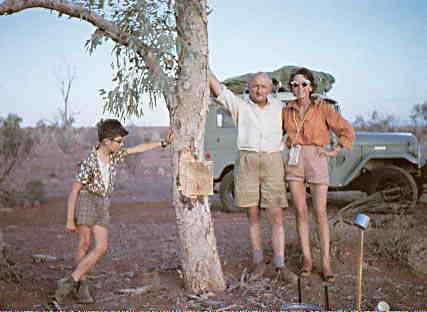 Poeppel and Wells – On return to base camp, Poeppel led a new survey with Wells as second in command and Geologist Harry Woodward to survey the NT / QLD border from Poeppels corner. They used native wells known to Wells for water supplies along their trip. At Field River, Poeppel had the misfortune of losing part vision in one eye. At this stage, John Carruthers replaced Poeppel as the Chief Surveyor until the party reached the Gulf of Carpentaria in Jan 1885. Wells had a high respect for Poeppel as a competent surveyor and bushman. Linday - David Lindsay mounted a major expedition with assistance from Sir Thomas Elder of the SA RGSA and the SA Government. Lindsay reached the Queensland boarder from the Dalhousie side and returned due to the illness of Charles Bagot. Lindsay used a number of local Aboriginals to locate native water wells enroute. Lindsay attempted a South to North crossing from Macumba River via Dalhousie, Mt Dare, Charlotte Waters, Finke, Arltunga to the Gulf. Theodore Day who became the Surveyor General of SA in 1921 travelled from Oodnadatta via camel via Dalhousie, Blood Creek, Anacoora bore (found bore producing 700 000 gallons a day while Colson in 1936 found a mud hole), through the recently established Andado station managed by the McDill Borthers up to the Todd & Hale rivers to Arltunga east of Alice Springs. Madigan - Began his investigation into the Arunta Desert (Simpson) for scientific research purposes while at Adelaide University as a Lecturer (First year of appointment). He quickly identified at the time that no motorised vehicle was capable of crossing the dunes and that horses and camels could only cross if water and feed was available during a good season. Madigan – Madigan obtained support for an aerial reconnaissance of the forbidding borders of the unknown desolate area of the Arunta Desert. Support came from the SA division of the Royal Geographical Society of Australia (RGSA) and the Royal Australian Air force. Madigan named this forbidden area the Simpson Desert after the industrialist Mr Allen Simpson who at the time was the president of the RGSA. Simpson was keen for this area to be explored and a full scientific investigation carried out. Albert (Ted) Colson at the age of 55 years and station owner of Blood Creek, Colson along with Aboriginal stockman Peter Ains travelled along the 26th Parallel from Mt Etingambra to Birdville and then returned via a more Southerly route. A total of 900km in 36 days. Due to being a self educated man with basic writing skills, his achievement and journals were not given the recognition deserved. Madigan - Accepted Allen Simpson’s proposal and £500 to fund a scientific crossing when the conditions were right to support feed and water. The £500 only covered equipment hire and out of pocket expenses. Dr Archibald Grenfell Price (President of RGSA – SA Branch) party setout in search of Leichhardt party around Makerinha waterhole due to reports of locals finding eight skeletons. On further investigation found to be calcified tree roots, however in the area aboriginal bones and teeth, English coins etc were found and could have belonged to the Leichhardt party. Colson – A second and more elaborate crossing was planned from north to south but never eventuated due to a lack of suitable resources. Madigan – Crossed the Simpson with a party of 9 men and 18 camels. They traversed 560km in 33 days. Colson - Killed in a vehicle accident 1950 near Balaklava while heading to Finke to make his first motorised crossing of the Simpson. Dr Reg Sprigg and family, first to make the crossing by car. Basically the French line is the Sprigg’s route. Sprigg latter spearheaded Oil exploration in the Cooper Basin with a company named SANTOS. CGG (Compagnie Generale De Geophysique) prime contractors for the French Petroleum Co. forged the French Track and other tracks for oil exploration purposes. However the oil discovery in the Simpson was of poor quality with no commercial value. Sprigg – 2nd Crossing South to North crossing from lake Eyre to Atula by motor verhicle. Bonython & McCubbin – Walked with the Comalco Camel from Atula in the North to Mt Gason in the South. 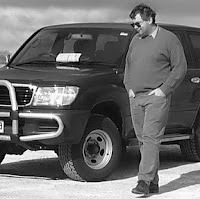 Bernard Faton – Frenchman attempted to walk across the Simpson Desert but was never seen again. Started his crossing from Finke with 16L of water a some cheese. Denis Bartell – made several crossings by foot. In 1979, Bartell retraced the Madigan crossing. Denis also located many of the native water holes used by the aboriginals and David Lindsay.